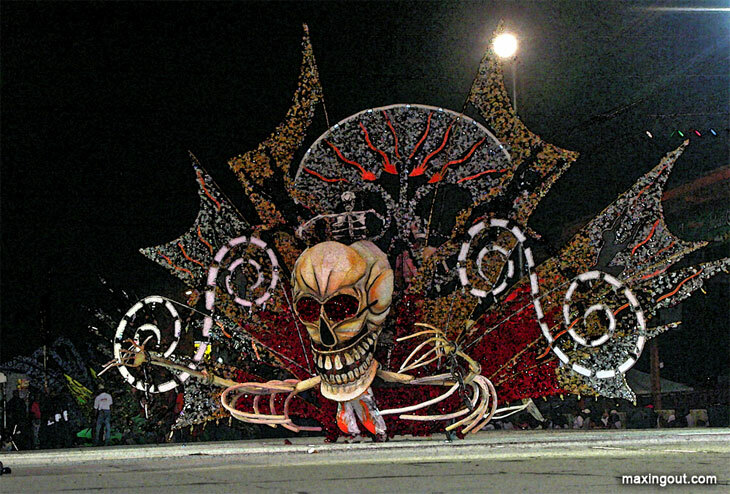 Carnival is a visually compelling experience. Tens of thousands of people march through the streets in surreal costumes creating enough memories to last two lifetimes. Carnival is impossible to explain with just words. Although words help, it must be seen to be understood. Carnival speaks the language of the mind. It's all about powerful images full of stunning colors burning themselves into your memory. If glitter is good, then carnival must be the best thing that ever happened on planet earth, because it's full of glitter and glitz.. 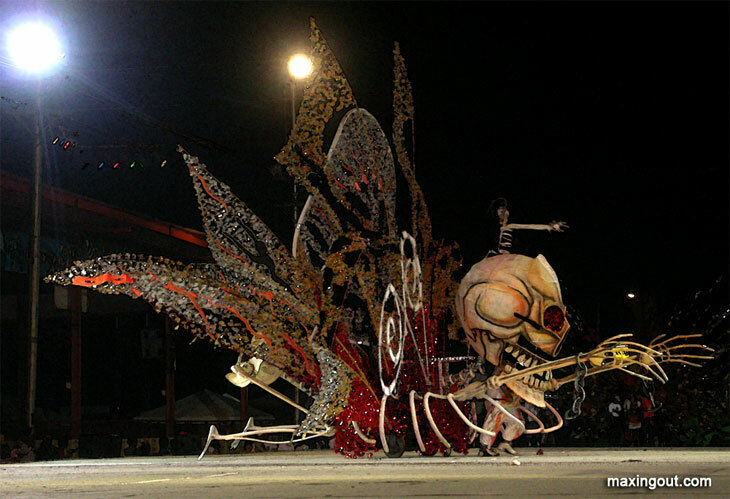 The costume in the above picture is more than twenty feet tall and at least twenty-five feet wide. Costume designers must limit the size of their regalia so it clears overhead electrical cables as revelers dance in the streets. The skull and bones theme of this design is indelibly imprinted in my memory. I will be able to recall it to my dying day. This monster of the mind doesn't frighten me, but it's the kind of thing that nightmares are made of in children. Monsters of the mind aren't your friend when you're offshore fighting for survival in stormy seas. In all my years at sea, I never had to deal with mental monsters, because I'm careful about what I allow into my mind. I've learned to carefully manage potential monsters. I don't put anything into my mind that could come back to haunt me while I am at sea. A good example of this is a movie called The Perfect Storm. I didn't watch the movie, because I didn't want to have those images in my consciousness. Dozens of people have told me they could never go to sea after watching that movie. Just looking at a boat brings images of The Perfect Storm into their mind. They visualize giant killer waves sweeping over their vessel and fear keeps them immobilized on land where they feel safe. It would have been hard to sail around the world if I had a storm phobia blowing through the corridors of my mind. I've only been in a couple of storms with winds in excess of forty knots, and I never experienced fear, because I didn't have any mental monsters blowing the winds out of proportion. When the wind comes up, and the seas become unruly, and a storm starts to take its toll on the crew, it's the storm of thoughts that causes problems. You can usually deal with the wind and waves without too much difficulty. But mounting exhaustion aggravates and augments waves of fear, and if fear takes control, a manageable problem can degenerate into something frankly dangerous. I can't speak for other people, but for me there's no question that when I'm exhausted in the middle of a storm, I don't want to have images of the perfect storm flashing in my mind. Those images could become mental monsters that compromise my judgment, and put my ship and crew at unnecessary risk. What I put in my mind is important, because I am the captain of Exit Only, and my crew trusts me and depends on my judgment. That means I should never do anything that could compromise my judgment under duress. I never allow things in my mind that could become a mental monster during a storm at sea. I sailed around the world for eleven years on Exit Only, and I never found any sea monsters or monster seas rising up to haunt me. Although I'll happily look at carnival monsters by the dozens, there's no room for The Perfect Storm in my memory banks. When the wind is blowing fifty knots, you'll not find the perfect storm howling in my mind.